Drivers in the market for a top-performing pickup truck often narrow their search down to a handful of popular makes and models. When doing a comparison of the 2019 Toyota Tundra and the 2019 Ford F-150, you’ll find a few key differences: Toyota offers better base model features and more powerful base engines with greater towing capacity. If you’re looking for a comparison of the 2019 Toyota Tundra vs the F-150, check out our review below. The 2019 Ford F-150 offers a range of engine options, but better performance will cost you more. The base engine is a 3.3-liter V6 engine putting out 290 horsepower and supplying 265 lb-ft of torque. The Ford lineup, however, has only one V8 option among its six engines. The 2019 Toyota Tundra is built for power from the beginning. It comes standard with a 4.6-liter V8 engine putting out 310 hp and boasting 327 lb-ft of torque for exceptional base model towing capacity. The second available engine is a 5.7-liter V8 engine with 381 hp and 401 lb-ft of torque. The difference in these two models’ engines shows on the track tests by Motor Trend. The Tundra is consistently faster than the F-150. The 2019 Toyota Tundra achieves 0-30 in 2 seconds, while the 2019 Ford F-150 lags behind at 2.5 seconds. The quarter mile times list Tundra at 14.6 seconds and the F-150 at 15.5. Overall, the Tundra hit a quarter mile speed of 93.6 mph while the F-150 hit 89.5 mph. 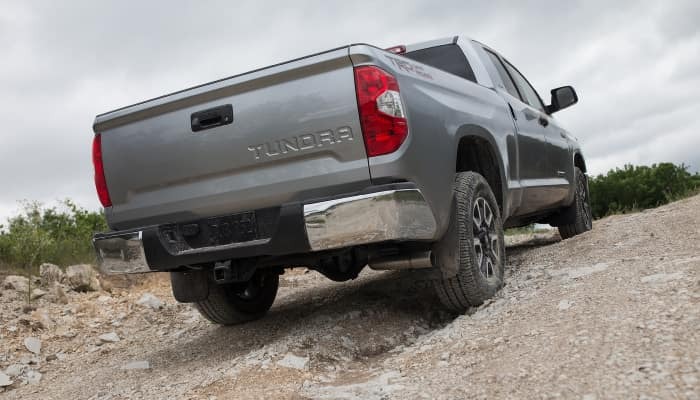 The Tundra also brakes better, with a 70-to-0 mph of 189 feet compared to the F-150’s 206 feet. The winning braking and handling of the Tundra is assisted by its larger standard 18” tires, where the F-150 has standard 17” wheels. When it comes to base models, the Toyota Tundra provides better trailer experience, pulling a maximum 6500 lbs compared to the F-150’s 5000 lbs. The dead weight hitch has a max tongue weight of 650 lbs in the Toyota vs. the Ford’s 500 lbs. Both makes can provide greater towing capacity with model upgrades, but base models paint a clear winner. The base models of both brands provide nearly equivalent box space, with the Tundra offering 55 cubic feet compared to the F-150’s 55 cubic feet. You’ll notice more difference in the long-box options for both trucks, with the Toyota offering 81 cubic feet to the Ford’s 77 cubic feet. The 2019 Toyota Tundra offers configurations for five or six passengers whereas the Ford F-150 seats only three in its base models. You’ll have to upgrade to the pricier SuperCab or SuperCrew Ford models to seat six passengers. With this additional row standard, the cab of the Tundra is able to offer more spacious comfort and better interior storage space. The 2019 Tundra is also known for its more comfortable ride in comparison to the Ford F-150. This is thanks in part to Toyota’s specially engineered longer wheelbase and front and rear stabilizer bars. The F-150 does not offer a rear stabilizer bar, and its shorter wheelbase makes its cornering and turning wider than its competitors. 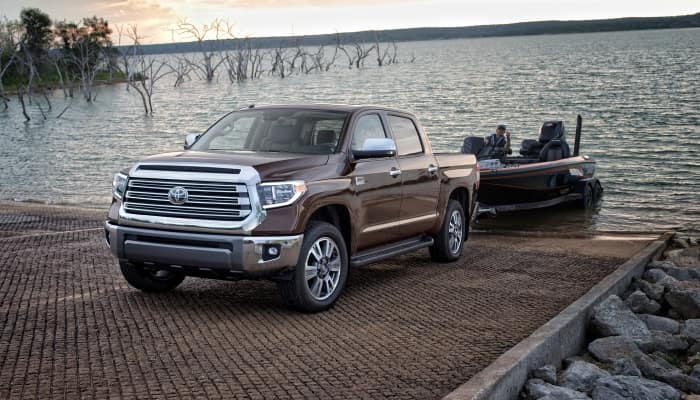 The 2019 Toyota Tundra offers several standard technology features that cost a premium on the F-150. 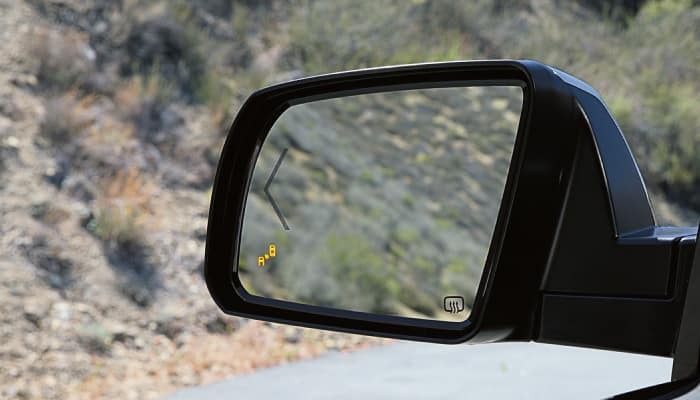 For example, heated outside mirrors, Bluetooth connectivity, and power remote mirrors come standard on Toyota but not on the F-150. The Tundra and F-150 offer competing proprietary infotainment systems. 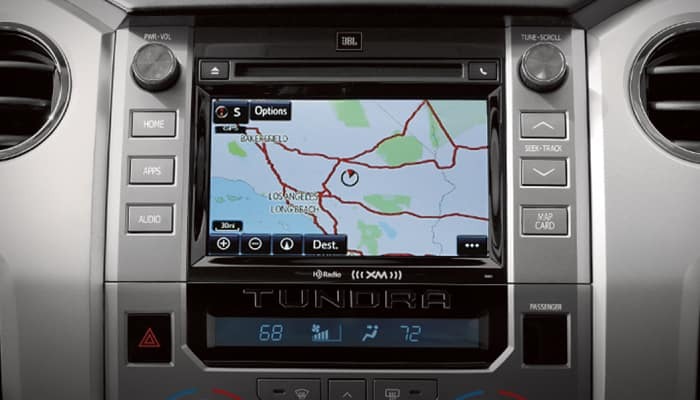 While Ford’s Sync 3 and Toyota’s Entune both allow smartphone connectivity, Entune provides more built-in features unique to the Toyota lineup. These include navigation with the ability to find local destinations (such as restaurants, hospitals, shopping malls, and fuel stations). The 2019 Toyota Tundra drivers can also view movie times and purchase tickets, track stocks, connect with Facebook, check traffic and weather, make dinner reservations, and more. 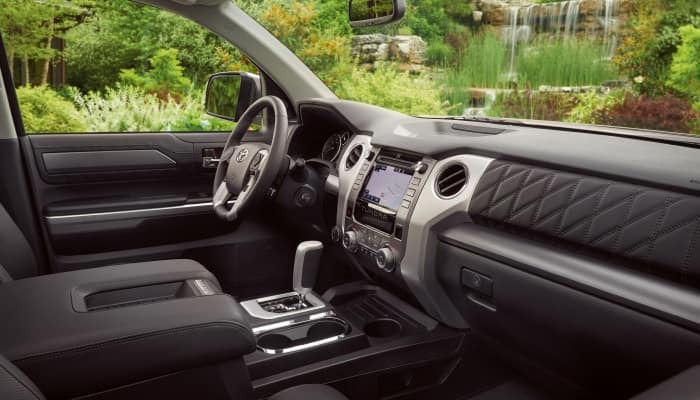 While the 2019 Toyota Tundra and the 2019 Ford F-150 both offer advanced safety features, the Ford F-150 does not include these important features in base models. The Tundra offers a wide suite of standard safety technology known as the Toyota Safety Sense package. This includes forward collision warning, automatic emergency braking, lane departure warnings, adaptive radar cruise control, and automatic high beams. The F-150 offers these for a price, but they do not offer Toyota’s driver alert monitor to alert inattentive or fatigued drivers. Why Buy from Arlington Toyota near Kingsland, GA? Arlington Toyota offers the latest 2019 Toyota vehicles like the work-tough, off-road-ready Tundra as well as a variety of sedans and SUVs. When you purchase or lease a Toyota, you know you’re driving home in a safe, dependable, and affordable vehicle. Do business your way, in your language—we speak Spanish and English! Arlington Toyota has been recognized by Toyota corporate for exceptional customer service in all areas of the car-buying process. Our eleven Toyota President’s Awards mean we have been hand-selected as “the best of the best.” Our teams treats you like family, from your initial contact with our helpful sales team to your time spent with our experienced, flexible finance team. Even our automotive service center has been top-rated for its expert workmanship on routine maintenance and collision repair. We invite you to visit our showroom today, or get your car-buying process started by viewing our virtual showroom of new and used vehicles. We aim to make your car-shopping process more convenient than ever with our suite of online tools, so explore our website and feel free to reach out to us with any questions! Call or stop by today—We are standing by to help find you the perfect 2019 Toyota Tundra at the perfect price.